And it got me thinking. Calculated Load is cool, but Absolute Load? 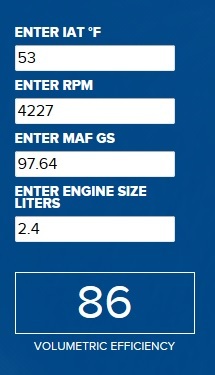 I honestly never noticed this before, as I spend 90% of my scanning time in OEM data, and not Global OBD. Reaches 1.0 at WOT at any altitude, temperature or rpm for both naturally aspirated and boosted engines. Indicates percent of peak available torque. Often used to schedule power enrichment. Compression ignition engines (diesels) shall support this PID using fuel flow in place of airflow for the above calculations. 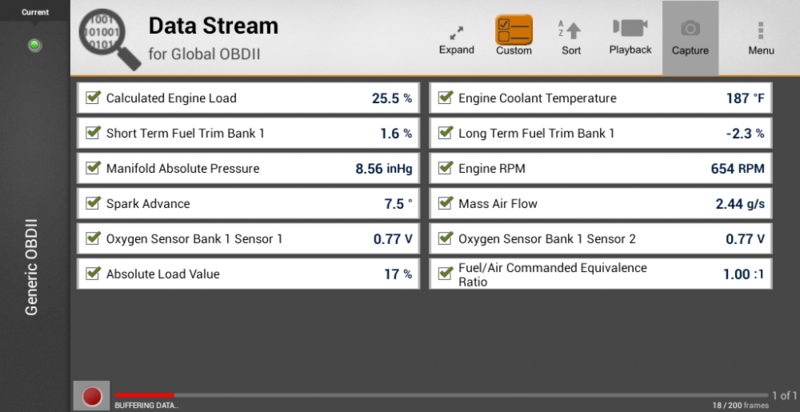 Indicates the pumping efficiency of the engine for diagnostic purposes. I underlined the parts that really caught my eye. Indicates pumping and volumetric efficiency? Cool! 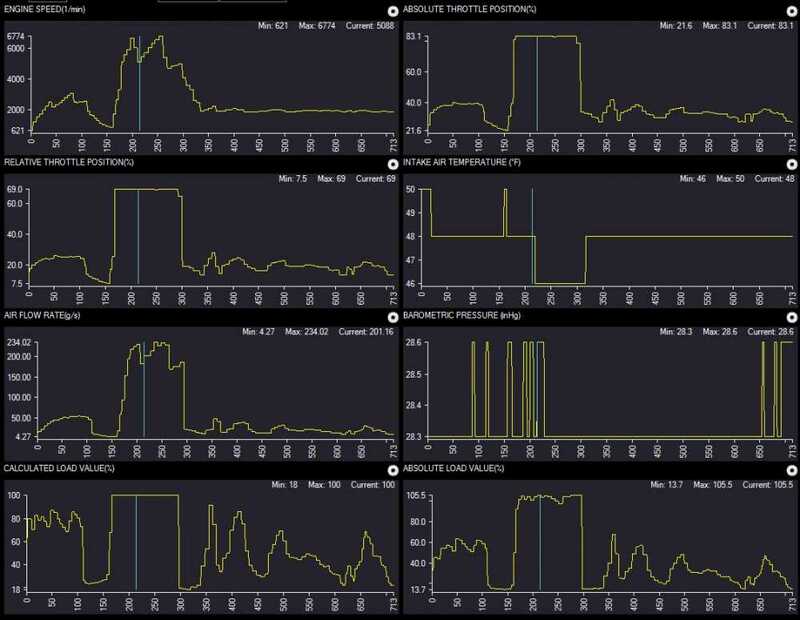 We're very interested in engine breathing during diagnostics. My question here is, should I be using this Absolute Load PID, instead of Calculated? Does one have more diagnostic value than the other? And are there situations where using both would be an advantage? Naturally, I decided to play with this on my own vehicle, but it doesn't have the Absolute Load PID. What's up with that? So, I'm looking to you guys for help! 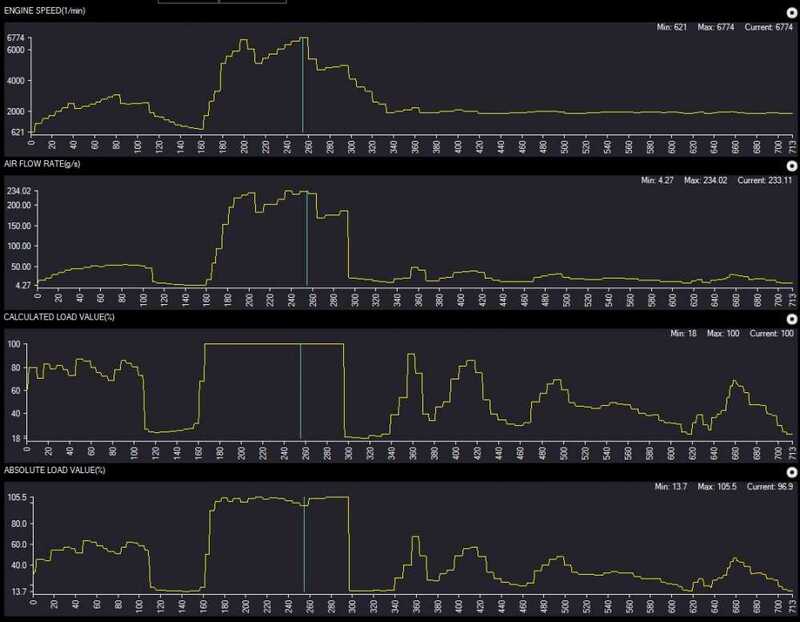 I'd love it if someone has a known good vehicle with both Calculated and Absolute Load PIDs, and is willing to get some WOT data captures. Snap-On tooling would be cool (to ease data sharing), but not required. 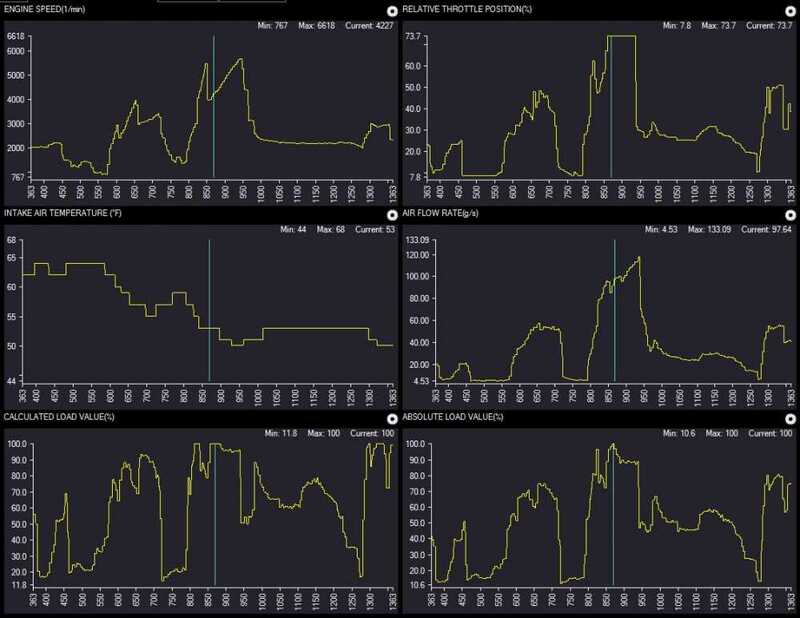 It'd be even cooler if you'd be willing to install an engine breathing problem (like an intake restriction) to see how the data responds. Last edit: 22 Jan 2017 21:19 by Tyler. 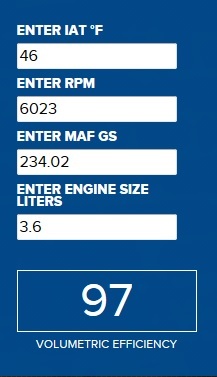 Had a chance to play with these PIDs on a '12 Equinox, 2.4L. 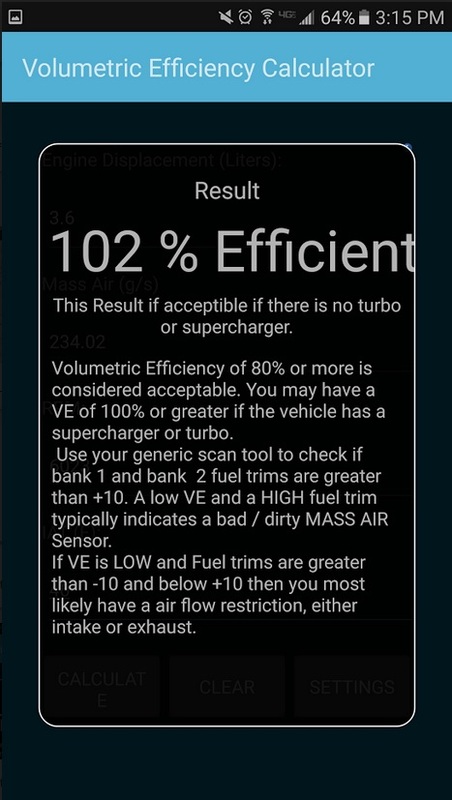 And what does the volumetric efficiency calculator have to say about that? 86% VE is pretty good, but it's definitely not the 100% reading Absolute Load was telling us. OK, maybe that was a fluke, let's look for the highest airflow rate instead. Nope. Still doesn't match. I could live with a percent or two off, but not like this. First experiment with Absolute Load, and I'm not impressed. I didn't have the opportunity to install any problems into this Equinox, but I'll be looking for the next opportunity. Just a quick reply to say I'm following and will definitely contribute when I can. I wonder what's missing here. I have been mulling this one over I would think comparing the differences between the graphs of calculated load and absolute load on a test drive could be useful. matt.white wrote: Just a quick reply to say I'm following and will definitely contribute when I can. Thanks, sir! I welcome anything you can contribute. Same. I mean, SAE obviously thought this PID had some kind of value, but I haven't seen it yet. To make things worse, I tried this same test on a '11 Buick Enclave, and it showed me an Absolute Load of 105%... I'll post that tomorrow. Heuh?? 105% Now I'm really confused! Round two! Got some more data off an '11 Enclave while test driving. 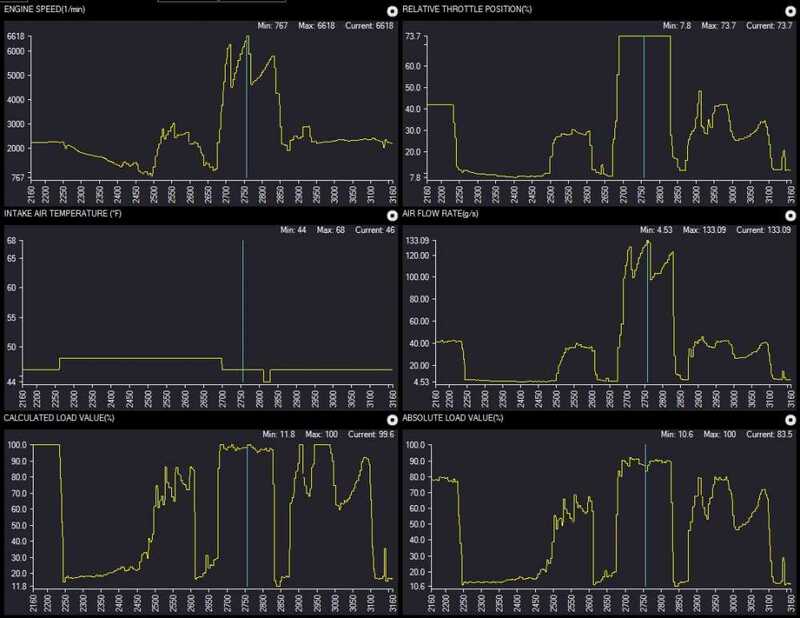 I think I'm better off sticking to whatever Load PID the OEM data gives me. I wonder if the Air Flow PID is a bit 'optimistic'? I'm not sure how the Global version calculates it. It may not be entirely based on the MAF sensor. Anyway, I tried again with an '06 GMC Yukon. I could post the data, but the short version is that it doesn't support the Absolute Load PID. Calculated Load is there, as always, but not Absolute. jcascel's '05 Mazda had it, why not this '06? Both engines have MAP sensors, so that's not the determining factor. Conclusion: Absolute Load is kinda useless. There's a reason no one in the industry teaches it's use. Not every vehicle has it, and it's not terribly useful on the vehicles that do. Oh well, it was fun to explore! This is how we develop diagnostic methods. Ended up taking a class that helped answer some questions that came up in this thread. 2.) The OTC volumetric efficiency calculator is incorrect. I'll be comparing it to other brands of calculators in the near future, but for now I'm taking off the Service Info thread. This is why I got all kinds of wacky readings earlier... There IS a software issue, just not on the vehicle side! 3.) Absolute load is a mandated PID from 2012 onwards, but appears on some vehicles before that when the OE decided to use it. So like I said earlier, I had an instructor inform me that the OTC calculator is NOT accurate. I believe him, but I wanted to see for myself. And here I was thinking that VE was a standardized calculation, and not open to interpretation. Tyler wrote: Thread bump outa nowhere! 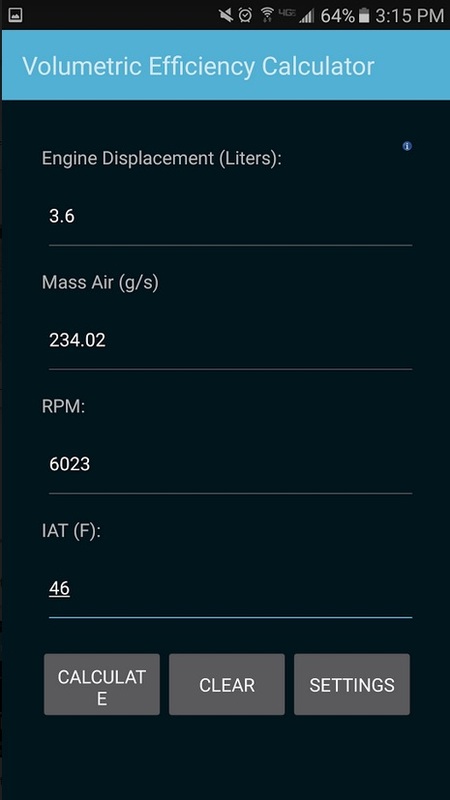 Also have a VE calculator from the Android playstore. There's also one I saw on the Autonerdz channel. Only if you have Windows. Anyway I'm excited to see this topic is back! I found it under VE Calculator. Maybe it'd be fun to take several for a spin? See how much variance there is out there. Another tidbit I got over the weekend is how valuable Absolute Load is for forced induction engines, particularly Ford Ecoboost platforms. 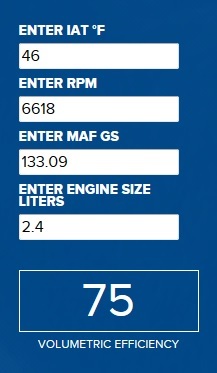 Somewhere between 155 and 185% is a good value on those engines.